Earlier this year we sadly lost a great friend, Gary “Bapper” Morris. When Blackwater Conspiracy began Bapper was one of the very first people to support us, coming to shows, buying albums & t-shirts and spreading the word to anyone who would listen about BWC, aswell as the many other great bands from these shores. Bapper believed in championing home grown talent and we, as well as every band in N.Ireland, were so grateful and proud to have known him and call him a friend. 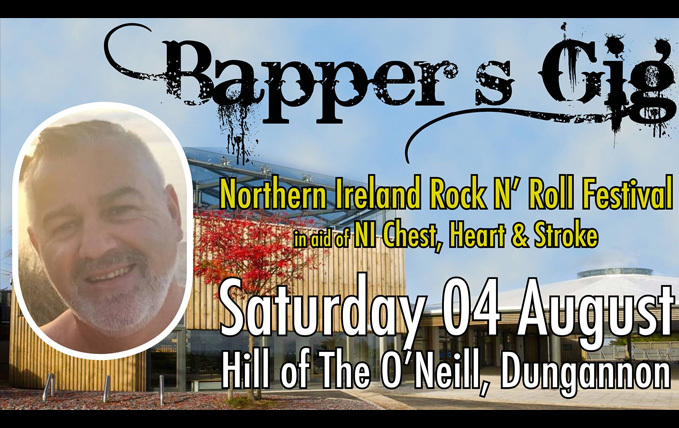 We’re honoured to have been invited to headline a very special concert in Bapper’s memory, on the Hill Of The O’Neill in Dungannon. Taking place on Saturday the 4th of August, the bill features the very best in local talent as well as the legendary Pat McManus of Mama’s Boys fame. Tickets are onsale now via Stewart’s Music Shop in Dungannon and all proceeds go to NI Chest, Heart & Stroke.